Physical description: About 8 to 12 mm in length. Dorsal side is brownish black with orange margins around the eyes and corium (especially thick along the margin of the corium that borders the membrane) and orange striations running down the length of the corium. 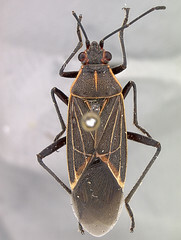 Margins of the scutellum that border clavus are similarly orange. Membrane is brown. The brightness of the orange margins may vary, but typically the thick orange margins of the posterior part of the corium are clear and form an orange upside down 'v' shape around membrane. Pronotum becomes very narrow anteriorly, making it appear more triangular in shape than trapezoidal. A distinct orange center line typically runs down the pronotum (not down the entire length) and the sides of the pronotum may be orange. 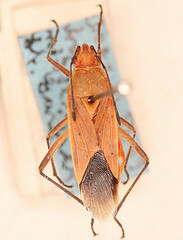 Ventral side is mostly orange, red, or ochre and coxae are similarly colored. Appendages are black. B. fulcrata flava specimen, Berlin Museum. Physical description: About 8 to 13 mm in length. Nearly identical to fulcrata except all places where fulcrata is dark brown or black in color, flava is orange. The striations on flava are more yellowish instead of orange (as they are on fulcrata) and contrast less with the overall color. Appendages are much lighter than they are in fulcrata and are more of a light brown color than black. B. fulcrata has been recorded in Guinea and Benin, but the exact location that it was found within those countries is unknown.